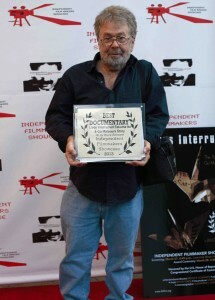 BEVERLY HILLS — The Independent Filmmakers Showcase presented the award for best documentary to “Lives Interrupted: The Takuma Ito and Go Matsuura Story” during its 2013 film festival on March 28 at Laemmle’s Music Hall Cinema in Beverly Hills. Director Bruce R. Schwartz accepted the award and gave a brief explanation of his documentary: “It’s a feature film that deals with the lives of two boys who were murdered. They came from Japan. I’m a professor at Marymount College [in Rancho Palos Verdes], where they were film students. Unfortunately, they met up with a gang member who carjacked them and killed them in cold blood. Josh Escandon, who appears in the film, attended the screening. Schwartz interviewed Escandon, who was Ito’s roommate, and other friends and relatives of the victims, all of whom shared fond memories as well as the shock they felt after Ito and Matsuura were mortally wounded in the parking lot of a supermarket in San Pedro in March 1994. The film premiered in October at the Warner Grand Theatre in San Pedro with Ito’s father, Akihiro, and brother, Hidehiko, as special guests. The father recalled that Takuma wanted to become a filmmaker from an early age. The family channeled their grief into a petition drive for gun control.